Have you ever looked at your child and wondered, Whose kid is this? Whether it’s talent, likes and dislikes, or the way he views life in general…he just doesn’t make sense to you. Yet it’s your responsibility to nurture him, provide for him, and equip him for adulthood. How on earth do you raise him when you feel like you can’t identify with him? Answer: Carefully investigate the china shop. When a parent doesn’t understand his/her child, one reaction is to push back. And push harder. Again and again and again. We do it because we don’t know another way to proceed. 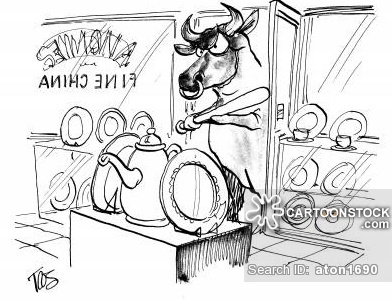 So, like the metaphorical bull in the china shop, we charge into the shop and keep doing the same thing, hoping that a different outcome will magically appear, when in fact, we just keep smashing the china. 1. To diminish heated battles, channel your inner Sherlock Holmes. Parenting a child you don’t intuitively understand is going to take some detective work. Put aside defensiveness. Can we agree now that every parent – you, me, and everyone else – has room to improve? Detective work requires you to objectively look at the facts. Nobody is calling you a crummy parent or a bad person. In fact, your tactics might work quite well with some children. Just not this child. Was there a reason why you did that? What were you thinking about when you said that? Were you already upset about something else? Request input from others who know your child. Ask your partner, or your child’s grandparents, or another trusted person to help you understand. Why do you think she was upset with me? How would you have handled it? Keep notes of ongoing behavior problems. Social Workers sometimes refer to this as “behavior tracking.” When I was employed at an inpatient facility, the staff would sometimes come to me with concerns about a client’s behavior. Some extremely serious behaviors called for immediate action, of course. But when it was possible, the staff took notes, collecting data that I could later review. If your child repeatedly engages in a behavior that puzzles you, draw yourself a chart. Immediately after the behavior occurs, note the following: Day of the week; Time of day; Location; Who was present; What was the child doing just prior to the incident? ; What triggered the child’s reaction? ; How did you respond to it? ; How effective was your response? After analyzing the data, you may recognize patterns. For example, if she balks at all instructions given right before bedtime, does she need to go to bed earlier? Or, maybe she can do some of those tasks earlier in the day. Try adjusting some of the environmental factors and see if she responds differently. Work smarter, not harder. Ask yourself, what makes her happy? What upsets her? What approaches have worked well with her in the past? Of course, there will always be things that upset her no matter how you approach it. “Go brush your teeth,” for example, is never going to be met with applause and confetti. But if you notice that she responds better to a certain approach that costs you nothing – such as setting a timer as a reminder – why not use it? I’m not suggesting that you allow her to skip tooth brushing altogether. Nor do I suggest that you coddle her, bribe her, or brush her teeth for her. Consider what it would cost you – emotionally and physically – to use a different approach. This is not a sign of you being a weak parent. In fact, this is a more peaceful way for you to get the outcome you’re looking for. Talk to people whose personality reminds you of your child’s. The cliche “Apples don’t fall too far from the tree” is true! If your son didn’t inherit many of your personality traits, he probably inherited them from someone else in your family. If you are raising a child to whom you have no biological connection, talk to friends with temperaments similar to your child’s. Ask these folks how they would recommend handling the situation. Ask how their own parents helped them. How do they wish their parents had handled them? Ask the experts. Social workers, psychologists, and other social scientists have written TONS of books and quizzes about personality. Myers-Briggs, StrengthsFinder, Love Languages, Four Temperaments… Read and learn. See what categories your child fits into. Find our what motivates her. What frightens her? Frustrates her? Delights her? 2. When times are good, be proactive. As I stated above, all parents have room for improvement. Put some of these tools in your back pocket and save them up for tougher days. See your differences as an opportunities to learn. I’ll never be a Jeopardy! contestant. My geography skills are so lacking that I wouldn’t get past the first pre-test. My son, on the other hand, devours maps. On several occasions, he’s helped navigate our family through places he’s only seen on maps, but never visited in person. Sure, there are lots of times when I’d rather not look at all his drawings of every I-75 exit in Michigan. But I will admit that I can better traverse downtown Detroit because of him. What can you learn from your child? A tenacious child demonstrates perseverance and loyalty. Where others see the mundane, an artistic child sees the possibility for beauty. Choose your battles carefully. Example: Keeping everything neat and organized may be important to you, but not to your child. In fact, her messy piles may make a lot of sense to her. If she can still find her shoes when it’s time to leave the house, if she’s able to get her homework done… Consider letting it go. Look for common interests. Find ways to spend time together that you both can enjoy. And if you can’t think of any, fake it. He needs your time and attention regardless. Be on the lookout for favoritism. You may not even realize you’re doing it. If your children are fighting with each other, for example, you may tend to side with the kid whose personality is like yours. (Tips for parenting that kid can be found in my previous post.) Take a step back from the emotional situation and objectively listen to both sides of the argument. We can learn from our kids, just like they can learn from us. Keep the defense shields down, keep an open mind, and never stop seeking to understand. Inspiring post, indeed ! Your list of good questions to ask is so relevant, especially “how do you think I should have handled it?”. Such a great way to understand better a child’s point of view. Thanks for writing these tips ! Thanks for your comment. I’m glad you found the post to be helpful!